It's been about two months since Jasmine and I did a Dynamic Duo and finally we're doing a Dynamic Duo...when we're both in the same picture! How crazy is that? I know it's not that much of a shock since you guys already saw us in the same picture (that wasn't photoshopped) during NYFW but this time we're purposely matching in our bow printed skirts from Urban Outfitters. This time I went for a navy top to bring out the bows in the skirt while Jasmine took the neutral route and added some red bows for some extra color. I love that we got dressed at the same time but ended up with really different looks with the same skirt. 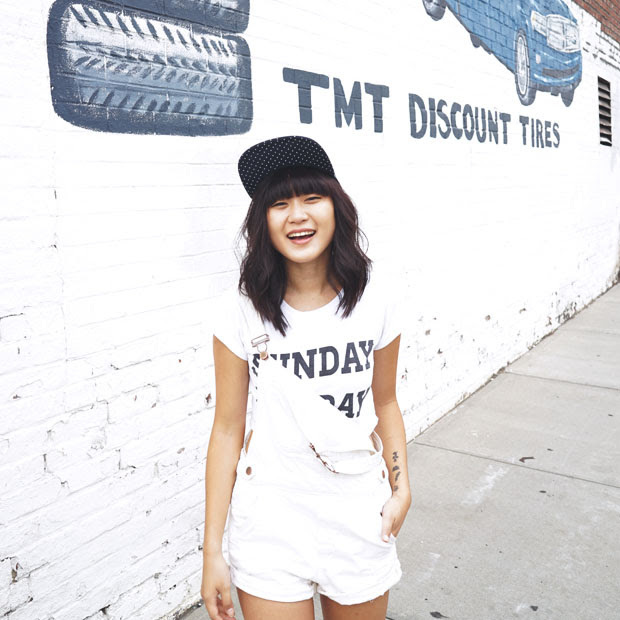 Looking at these pictures actually makes me miss Jasmine a lot, including all of the other bloggers I met at NYFW. Seems like it was just yesterday, but at the same time it feels like a million years ago. I'm blogging at work again (shame on me) but what do you expect me to do when I'm sitting in front of a computer for four hours?! I'm bound to wander off onto blogspot and do some browsing and updating. I'm getting work done but taking a break every now and again can't hurt. I better get back to designing the web page layout I'm supposed to be working on. 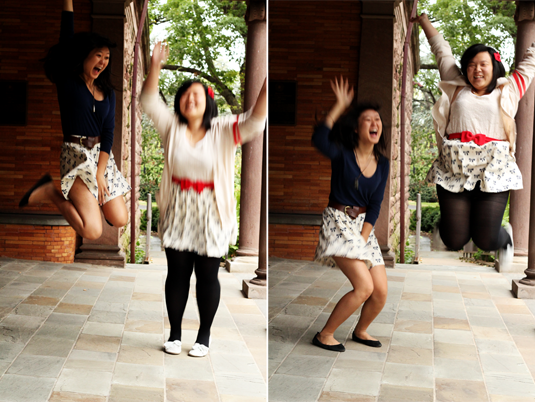 HAHAHAHA the jumping pictures made me laugh so hard. Gosh you 2 are sooo silly :) I'm loving those skirts too, gotta love bows, right? <3 I love how we can see your different takes on the skirt too! 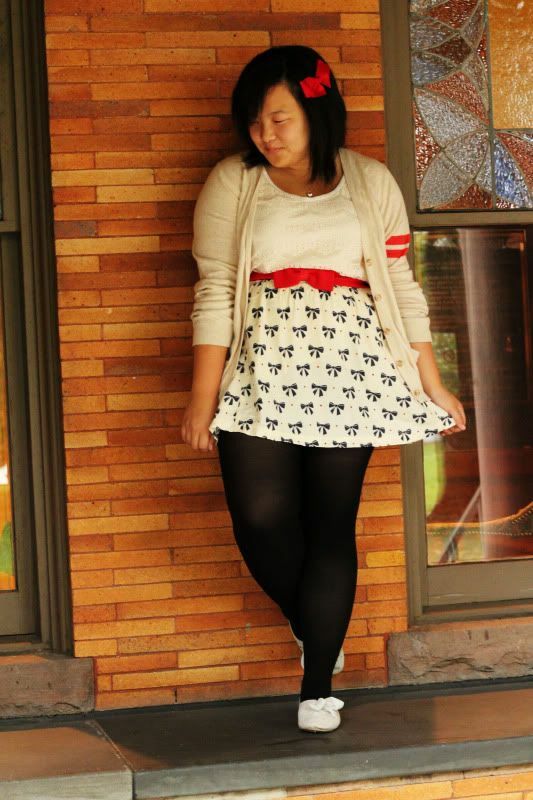 Love the way you styled the skirt-anything with bows is just darling! LOL I LOVE THOSE JUMPING PICTURES! Your facial expressions are priceless! And I just adore your bow skirts, I was actually contemplating on buying one myself but decided I had too many skirts. Glad to see them on both of you instead! I love both of your looks as well! Both of you are the cutest. For some reason this outfit styling reminds me of yin and yang. For the simple reason that you wore a dark color top and Jasmine wore dark colored tights. So the effect is opposite and pleasing, different but same. Love the photography. You girls always seem to have so much fun doing your outfit posts. i am all smiles. Love it. aawwww so cute!! that skirt is the perfect dynamic duo piece!!! :D you both styled it well!! so cute! I want that skirt. Awww, you two looked soooo cute together.. I love that skirt! cute 100x skirt! Are you planning on expanding the Dynamic Duo into a Dynamic Trio? :p I want that skirt! ahh I really want your skirt,I have yet to see it in f21 ! I saw this photo shoot on her blog and now on yours. You two are so adorable! I love how you dressed the same skirt up in two different ways. It looks adorable either way! dynamic duos are my faves :) you two are just too too cute. that bow printed skirt is beyond adorable! really love how both of you styled it. I'll tell you like I just told Jasmine, you two are soooooo adorable! So fun pictures, i love it!!! Ahhhh your jumping photos are awesome!! hehehe. 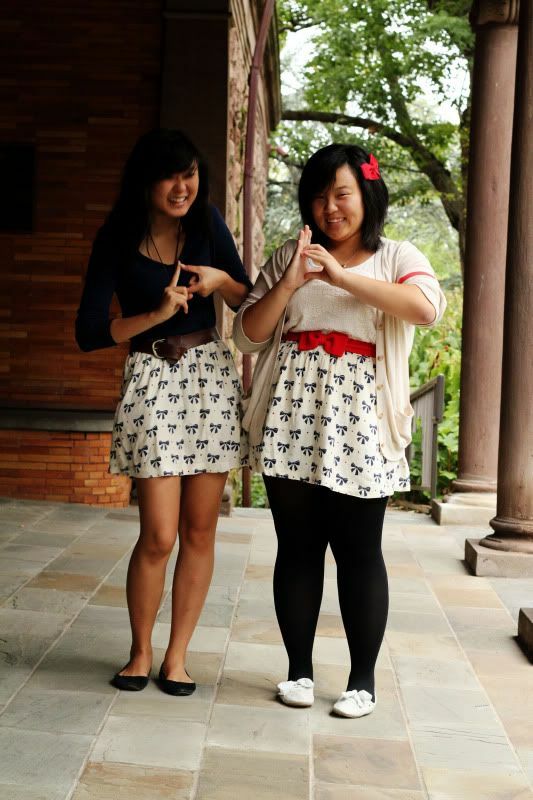 Seriously, you two are adorable together, and I love both your looks with the bow skirt.